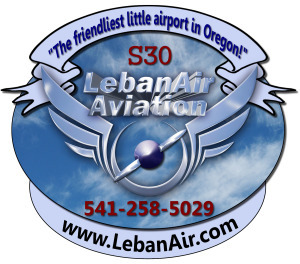 LebanAir has already be dubbed “The friendliest little airport in Oregon.” We are now working with local Lebanon businesses to make Lebanon the most “pilot friendly” town in Oregon as well! 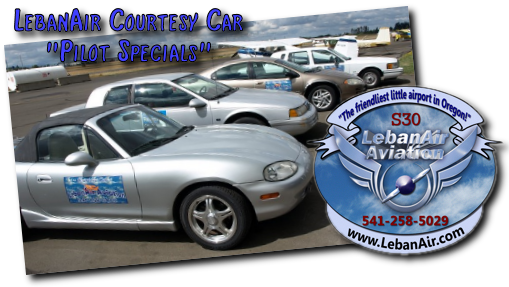 Now when you fly into S30 and use one of our courtesy cars to drive into town, you are entitled to nice discounts at participating Lebanon businesses! Each set of courtesy car keys has a special tag on it. 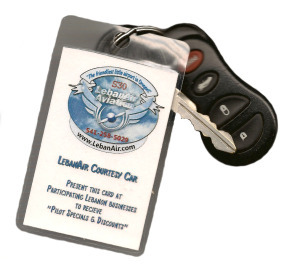 To get your “Pilot Special” or discount, all you have to do is show the LebanAir Courtesy Car key tag when you pay for your order. It’s that simple! Below is a list of participating businesses. The list is growing, so check back often. And be sure to thank them for their support of General Aviation by offering “Pilot Specials” by patronizing these pilot friendly businesses. Click the business name to see their “Pilot Specials” a map to their location and other information about the business. Mama’s Fine Italian & Wine Shop – Mama’s uses the freshest ingredients to produce quality products at the best price available. We cut our salad and produce fresh daily. We make the dough for our pizza and bread sticks along with grating fresh Parmesan cheese for our dishes. Kevin’s Cafe – Got an appetite? You have to try Lorene’s! Homestyle food. Really low prices. Great waitresses and cooks. This is a favorite of the locals. Seating is limited, so you usually have a short wait if its early morning. Lunch is great, too. Nothing fancy on the menu, but the best hamburgers in town. Restaurant Y Taqueria – Authentic Mexican food made with the freshest ingredients possible is the difference everyday at Taqueria Alonzo.